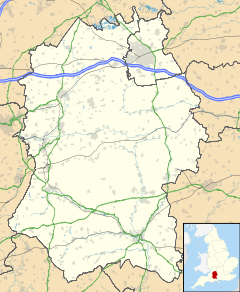 Upavon is a rural village and civil parish in the County of Wiltshire, England. As its name suggests, it is on the upper portion of the River Avon which runs from north to south through the village. It is on the north edge of Salisbury Plain about 4 miles (6.4 km) south of Pewsey, 10 miles (16 km) southeast of the market town of Devizes, and 20 miles (32 km) north of the cathedral city of Salisbury. The A345 and A342 roads run through the village. Most of Upavon is between 90 and 100 metres above sea level. The occupation of Upavon dates back to the Iron Age settlement at Casterley Camp which lies approximately 1.5 miles (2.4 km) west of the current village. The first mention of Upavon itself is in the Domesday Book as 'Oppavrene'; though there are no details it can be estimated that the village supported some 200 to 250 people The Iron Age settlement of Chisenbury Camp also lies close by to the southeast. The village prospered during the 12th and 13th centuries and started to develop features that are recognisable today. A large Norman church replaced the previous Saxon one, a manor house was built in the south of the village and a market square developed west of the church in the area that now lies between the two village pubs. All significant local government services are provided by Wiltshire Council, with its headquarters in Trowbridge, and the parish is represented there by Paul Oatway, who succeeded Brigadier Robert Hall in 2013. Its Member of Parliament is Claire Perry, Member for Devizes. The village falls in the 'Pewsey Vale' electoral ward. Upavon, the most populous area, lies at the southeast of the ward which stretches north to Wilcot. The total population of the ward taken at the 2011 census was 4,461. Upavon airfield, now called Trenchard Lines, and previously RAF Upavon, is situated about 1.5 miles (2.4 km) east of Upavon village. The site was originally constructed around 1912 as a Royal Flying Corps (RFC) base, and became the home of the RFC Central Flying School on 19 June 1912, later to be the RAF Central Flying School upon formation of the Royal Air Force. Upavon is referred to as the birthplace where the Royal Air Force was formed. Since 1993 the main function of the military base has changed, and it is now largely an MoD administrative centre, and home to administrative headquarters of the British Army. Today the airfield is still used by the RAF from time to time but is now most frequently associated with regular glider activity, with the only permanent RAF unit based there being No. 622 Volunteer Gliding Squadron, providing glider training to members of the Air Cadet Organisation. The Army Gliding Club also uses the airfield in co-operation with 622 VGS. The Anglican Church of St Mary is Grade I listed. It has a 13th-century tower and was restored in 1875 by T.H. Wyatt. Upavon Baptist Chapel, named for the Cave of Adullam, was built in 1838. A Methodist church was built in 1966, replacing an earlier tin chapel. It closed around 2006. The village has two public houses, a corner shop, a doctors' surgery, a small hairdressers salon, a village hall and a golf course. The nearest secondary school is at Pewsey and the nearest primary school is at Rushall. A school was built at Upavon in 1957, replacing a 19th-century building, to cater for children of RAF personnel; up to 200 pupils could be accommodated. Pupil numbers declined as RAF activity reduced and fell further after 1993 when the station was transferred to the Army, leading to closure of the school in 2009. Service Children's Education has its headquarters in Trenchard Lines near Upavon. The nearest mainline railway station with links to London Paddington is Pewsey, about 3 1⁄2 miles (6 km) away. Pevsner, Nikolaus (1975). Cherry, Bridget (ed.). The Buildings of England: Wiltshire. Harmondsworth: Penguin Books. ISBN 0 14 0710-26 4. ^ "Parish population 2011". Office for National Statistics. Retrieved 14 March 2015. ^ "Upavon History". Wiltshire Community History. Wiltshire County Council. Retrieved 20 February 2010. ^ "Pewsey Vale ward 2011". Office for National Statistics. Retrieved 14 March 2015. ^ Historic England. "Church of St Mary, Upavon (1365553)". National Heritage List for England. Retrieved 8 June 2015. ^ "Church of St. Mary the Virgin, Upavon". Wiltshire Community History. Wiltshire Council. Retrieved 8 June 2015. ^ "Strict Baptist Chapel, Cave of Adullam, Upavon". Wiltshire Community History. Wiltshire Council. Retrieved 8 June 2015. ^ "Primitive Methodist Chapel, Upavon". Wiltshire Community History. Wiltshire Council. Retrieved 8 June 2015. ^ "Victoria County History – Wiltshire – Vol 10 pp159-173 – Parishes: Upavon". British History Online. University of London. Retrieved 8 June 2015. ^ "Upavon Primary School". EduBase2. Department for Education. Retrieved 8 June 2015. ^ "SERVICE CHILDREN’S EDUCATION ANNUAL REPORT AND ACCOUNTS 2012–2013" (Archive). Service Children's Education. PDF p. 3/62. Retrieved on 28 February 2015. "Any enquiries regarding this publication should be sent to us at Headquarters Service Children's Education, Trenchard Lines, Upavon, Wiltshire"
"Upavon". Wiltshire Community History. Wiltshire Council. Retrieved 8 June 2015.